The (curious case of the) Watson Intelligence is an American play written by Madeleine George, directed by Michelle Bonora, performed by the A Civic Staged Readings Production at the Civic Theatre of Greater Lafayette / Monon Depot Theatre (Lafayette, IN, USA) on 16 may 2017, starring Jason Wallace as Dr. Watson. 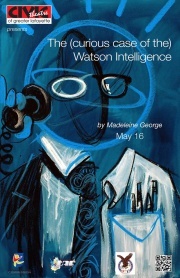 Jason Wallace played 4 Watsons (Dr. John H. Watson dressed as Sherlock Holmes ; IBM's computer named Watson ; Thomas A. Watson, Alexander G. Bell's assistant ; and Watson, an IT guy). There is no Sherlock Holmes character in the play.